Russia Plans To Deploy More S-400 Missiles To Disputed Crimea Peninsula Russia's military already has three of the S-400 "Triumf" divisions on the Black Sea peninsula; it plans to have another in place and operational by the year's end. Russia is sending a new division of S-400 Triumf surface-to-air missile systems to Crimea, in a new sign of heightened tensions. Here, one of the systems is carried during the Victory Day military parade Russia held in May. 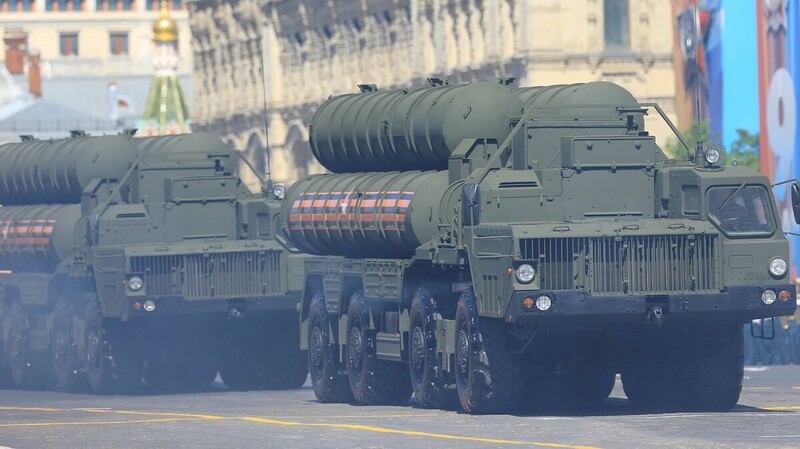 Russia's military already has three of the S-400 "Triumf" missile divisions on the Black Sea peninsula; it will have another in place and operational by the year's end, said Col. Vadim Astafyev of Russia's Southern Military District, according to the state-run RIA Novosti news agency. The mobile S-400 missile has a range of up to 400 kilometers (250 miles) and can climb to an altitude of 30 kilometers (18.6 miles), Russia's military says. It's intended to bring down a variety of aerial threats, from aircraft to cruise and ballistic missiles. As the news emerged on Wednesday, Russia's defense ministry posted video of the latest iteration of the S-400 system going through final trials, saying it "successfully struck eight high-speed low flying targets." Russia has faced widespread criticism since its ships rammed and fired upon a group of Ukrainian vessels that had been attempting to cross between the Black Sea and the Sea of Azov on Sunday. U.S. Ambassador to the U.N. Nikki Haley called it an "outrageous violation of sovereign Ukrainian territory," during an emergency meeting of the U.N. Security Council on Monday. Ukraine has imposed martial law in response to the armed confrontation, which it says is another in a string of acts of aggression. In response, Russian President Vladimir Putin claimed on Wednesday that the incident was a provocation designed by Ukraine's President Petro Poroshenko, who faces weak public support ahead of elections planned for early next year. The Moscow Times cites analysis by U.K.-based think tank Chatham House in reporting that the aggressive action is likely "simply the latest gambit in President Vladimir Putin's long game to chip away at his neighbor's economy to undermine the revolution that booted out its Kremlin-backed leader in 2014."